Register Domain SA Review 2019: Is Register Domain SA a Good Hosting? Register Domain SA is a longstanding South African hosting company. They’ve got worldwide customers and an excellent uptime service level agreement. Founded in 2003 under a different name, then rebranded to Register Domain SA in 2005, this website hosting provider is based in Cape Town, South Africa. They have customers in South Africa, the rest of Africa, and the rest of the world. Their website and support are provided in English. The first thing that impressed me about Register Domain SA is their 99.99% uptime service level agreement that is clearly explained in their comprehensive terms and conditions. They owe this high uptime to their infrastructure and servers across three data centers with 100% Juniper network and a 10Gbps fiber ring provided by local providers AfricaINX and Internet Solutions. They also have N+2 redundancy, which decreases their power consumption and carbon footprint. Register Domain SA offers four shared hosting plans called Basic Hosting, Standard Hosting, Pro Hosting, and Premier Hosting. They all include unlimited traffic (with a very clear usage policy), unlimited databases and email accounts, as well as 500MB, 2.5GB, 10GB, and 25GB disk space respectively. All plans come with the MailScanner anti-spam system, an antivirus scanner, and remote webmail access. As well as having fairly good resource quotas, the plans come with nice added value features. For beginners, all plans come with the Installatron one-click installer, pre-installation of WordPress, Joomla! or Drupal CMS, shopping cart tools, and a three-page Weebly website builder. For more advanced users, they also support PHP (unspecified version) and MySQL databases, but they do not support advanced coding languages such as Rails, Python, or Java. Although the Basic and Standard plans are quite affordable, and generally in line with local and international competitors, the Premier and Pro plans are quite expensive, especially given they don’t support many advanced features. SSL certificates and domain registration both cost extra. You can purchase hosting for one month or one-year terms, and the price does decrease a little when you purchase one year upfront. They offer a generous 30-day money-back guarantee which is hidden away in their terms and conditions. I am impressed by their knowledge base that has a good number of documents and a network status page. Although they have local Cape Town and Johannesburg telephone numbers, they appear to prefer support requests to be submitted by ticket. While it would nice to see a few additional support options, at least they are quick to respond to tickets. Register Domain SA may not be the “best in class” for any particular feature, but they do offer good all round plans with some nice beginner-friendly features and excellent terms and conditions. 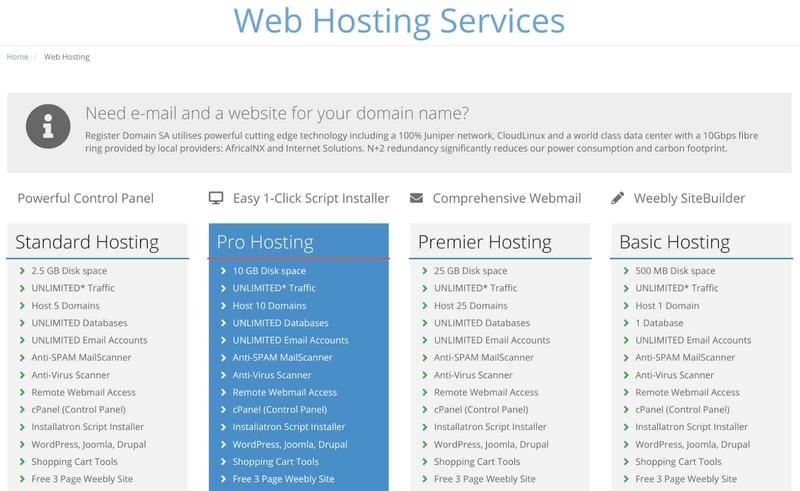 Wondering how Register Domain SA stacks up against other Web Hosting companies? Enter any other Web Hosting company and we will give you a side-by-side comparison.